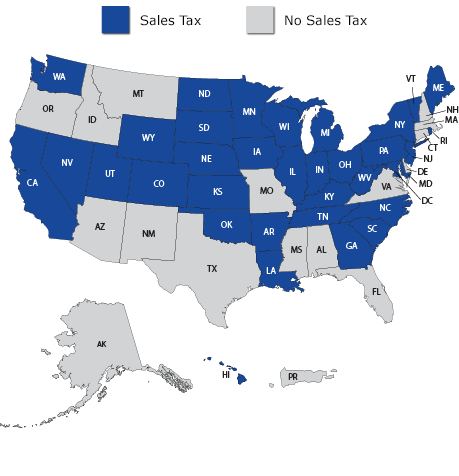 Specialty Bottle is required to collect sales tax in the highlighted states on the map below. The tax amount will be shown at checkout after you enter your shipping destination. If your purchase is exempt from sales tax (e.g., purchasing for resale), please see our instructions below for providing us with a properly completed exemption certificate. SELECT: Select your state from the list below. If your state is not listed, we will not collect tax on your purchase. COMPLETE: Download and complete the exemption certificate displayed for your state. SUBMIT: Fax the completed exemption certificate to 206-382-1120 or email the certificate to service@specialtybottle.com. Tennessee: Provide a copy of your Resale Certificate. [More Info]. Washington: Provide a copy of your Reseller Permit. [More Info]. If you submit an online order and are charged sales tax at checkout but you have submitted (or are in the process of submitting) a completed exemption certificate, please contact us for a refund of the tax collected on your online order. Please contact Customer Service if you need additional information or have any questions about sales tax.